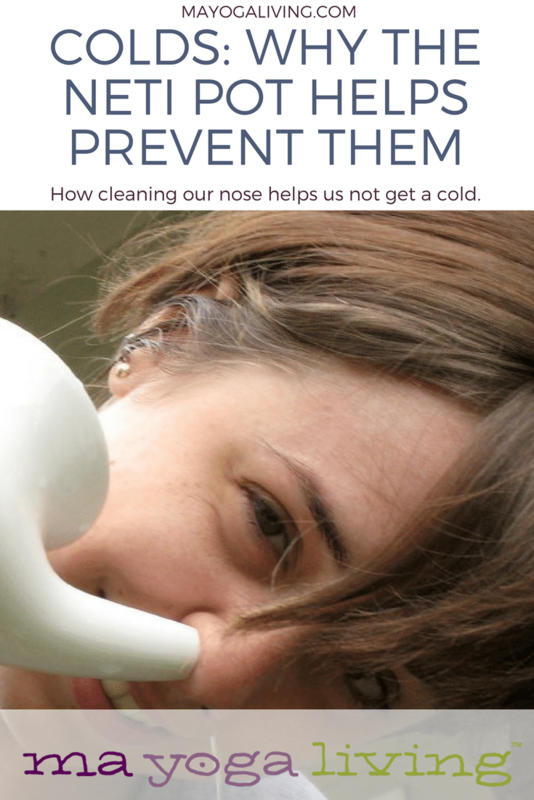 How could cleaning our nose help us not get a cold? I’m the cold master. The Queen of Colds. Colds are my jam. I’ve gotten them for a good portion of every winter ever since my daughter was born, and canceling teaching gigs is just part of the season. Even as a kid, I had terrible allergies to cats and dust and pollen and was mucous-y a lot. 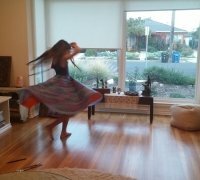 I took care of the mucous problem in my 30’s by reducing gluten and completely omitting dairy from my diet. I even got two cats, and now I’m not allergic anymore, which for me is the universe’s miraculous answer to every birthday-cake wish I ever made: “please let me not be allergic to cats.” It feels weird to be able to say your wish out loud, but it’s come true! But I kept getting colds, and once my daughter was born, they seemed to overlap all winter. I studied Ayurveda, the oldest health system still in use today, and honed it down to some life-changing lifestyle routines and principles for busy mamas and called it MAyurveda. I got my colds down to one per winter, through different spices and daily rhythms. But this year – kaboom! I didn’t get one, and I think the neti pot was the final, special sauce. The first and most important thing I’ve learned – and you already know this: colds are nature’s way of getting us to slow down. When we get out of step with our natural rhythms – staying up late, eating late, having a lot of processed foods – we handicap our body’s ability to fight the germs that are always around. It’s hard as a new mom to slow down, and many of us ignore the reminders to sleep when the baby sleeps. I changed “sleep” to “rest.” Take a bath, lie around – just don’t be productive in the more masculine, get-it-done sense. Let the dishes pile up. Allow yourself to have a task list for the week, rather than for the day. Go easy on yourself. Life will be there when you return. And as a Mantrapreneur – someone who’s got their own chosen path where there’s always exciting work to do, it’s so important to draw boundaries around your work life. Find your daily practice (even 5 minutes is sufficient) of meditation and yoga and never compromise it (here’s an excellent way to create a morning power practice for yourself). And when you do realize it’s been days, just get back to it. The body uses mucous to surround foreign cells. The body must then get rid of the mucous, or it becomes the problem. Mucous itself is a breeding ground for more germs. And when that happens, your body keeps making more mucous – otherwise known as a cold. You become a crazy, drippy, mucous-forming machine. Your body can’t get rid of it fast enough to keep up with production. When you have a cold, the body uses heat to help get rid of mucous, which is categorized as cool, earth energy. We can support the body’s warming process by using spices. The first thing I do when I feel a cold coming on – that little itch in the throat, or a tiny bit of fuzzy head – is I go to the spices in my kitchen. And put some in some boiling water. Drink. It will support the body in burning up the mucous and help it fight the good fight. I even gave some ginger/cinnamon/clove/honey mix to my toddler to help ward off the evil cold. But when I committed to doing it every day, something changed. I no longer sniffled and sneezed in the morning. I didn’t have that slight sore throat when I’d had a crazy long day. I felt like I could breathe easier. It’s pretty easy. Just boil water to make sure it’s germ-free and let it cool (I boil it the day before, leave it in the glass cup measure and then microwave for 30 seconds in the morning), add ¼ t of pure sea salt, lean over the sink, and pour it in one nostril. Amazingly, it just comes out the other! I find that if I lean over about 45 degrees, turn my head and look slightly up at the mirror in front of me I’m at a good angle. You will not believe how much snot will come out and how many times you have to blow your nose after! The biggest surprise for me was that this winter I didn’t get a cold. At. All. For the first time ever. 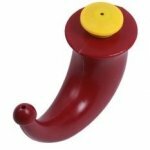 I drank the occasional spicy tea; I went to bed early and had low-productivity days when I was feeling run down, but the Neti Pot is now something I won’t spend a winter without. 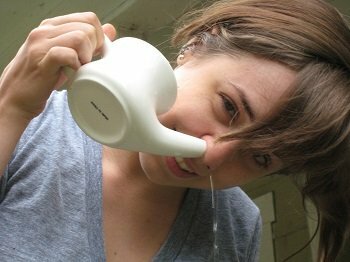 Here’s a great article on how to use the neti pot from the Himalayan Institute. And here’s the Netipot I like to use from Peleus Tech ($6). 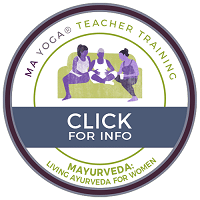 If you’re a teacher or practitioner, or just someone who wants to dive deep into the ancient but profoundly effective wellness practices of Ayurveda, join me for my online training, MAyurveda: Living Ayurveda for Mamas, starting March 22, 2018.